Rollerball Perfumes linger longer! Makes a great gift! Beautiful refillable bottle fits perfectly in your purse. 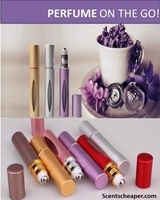 You will receive a beautiful perfume rollerball bottle with your choice of Perfume Oil (1/3 oz) Choose your fragrance choose your color bottle. Refills are available. See below. You will receive a 1 oz refill fragrance oil of your choice, with refill instructions. Plastic flip bottle.